I guess I am a typical male when it comes to skin care. My approach is I want to do as little as possible, the skin product should not burn my skin after shaving, I do not want to see any skin reactions, and the skin care product should not leave my skin feeling greasy or look shiny. And oh yes one last thing I prefer the product to not have a smell or feminine feel to it. I have decided to write a small series on male skin care regimes so that we can find products that suite your skin, time, personal likes and dislikes, and budget. With just a few products that are correctly chosen we can get some amazing skin benefits. Oily skin: shiny skin with some visible blackheads or pores. Combination skin is the most common and some areas of the face will feel dry while other will feel oily or have a shine to it. Dry skin may feel tight and dry during the day and is characterised by white or flaky areas on the face. 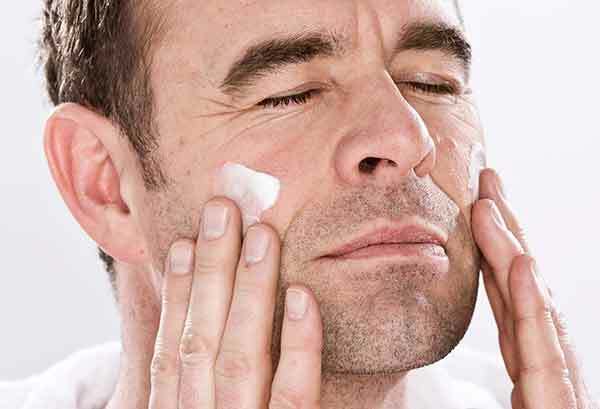 Men who suffer from dry skin may even have red or inflamed patches and often complain that parts of their face feel rough to the touch. Occasionally the culprit for dry skin is using the wrong skin-care products. Sensitive skin: is typically identified by an overall redness or inflamed areas of the face and one tends to find that applying skin care products aggravates the inflamed areas. I have listed a few product choices for each skin type but please feel free to contact me for a more personalised skin care approach or take our Face2Face Skin Assessment to receive a personalised skin care regime. Great article, I’ve just sent it to my husband, hope he pays attention! Thanks Dr Alek for good information on a topic that really should be noted by all males. Hi Geoff glad you liked it. The shaving advice is great as we do need a warm skin before shaving for best results. I have startaed using some of the Dermaquest products and have found them to be great for my skin. Kind regards Dr Alek Nikolic. This is a valuable article. I have often seen men using granular face wash and not realising how damaging it is to ones skin. It would be interesting if you could possibly comment or do a short article on granular face washes.